Thank you very much for the letter in which you wrote so much. Now I am asking again. How are Jaantje's children doing? Trijntje used to be not very healthy, she was growing so fast and early. So it was with our Jaantje who is always healthy now. They have two nice girls. The oldest is going to school, she will come [to me] on an afternoon with the youngest. Last year they moved to a bigger farm. Last Dec. Do and Ytje also moved to a bigger farm. Now they live farther away, one girl is going to school and she also has 3 little one's at home. She is not coming often because she cannot drive a car and her husband is too busy. Jaantje and Geertje too are coming with the car on their own,but mostly Dalton and Geertje come together. Last Sunday they were here. Thies [Thijs] has had a severe flue but is recovered now. Besides that we all are well. I can walk on my own now, both my crutches are standing in the bathroom. At first when I was home I was using a crutch because my feet were not strong enough, in the evening they were badly swollen. Now I still have bandages on my ankles but it is much better and now I can walk where ever I like to go, however walking the stairs I still find that not easy. Nevertheless my house is very comfortable and convenient so I can do my own job again. On Dec. 25th I was with Dalton and Geertje wearing my slippers. My feet were still to thick to wear shoes but it was no problem for them. They came with the car and also took me home that way. It was a very pleasant day for all of us. Dalton's mother and grandmother and his sister and her husband were there too. Then I have to talk English but it is not that difficult. In hospital I got used to do so. 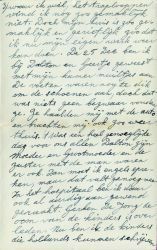 Gerben de Jong, the uncle of the children, passed away. 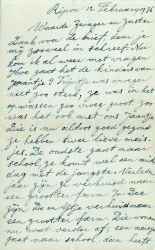 Now I tried to urge the children, the one's who are able to write Dutch, to write a letter to show their sympathy, but if they'll do so, I don't know. 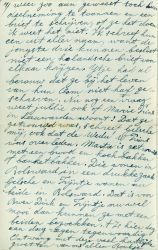 I wrote to the relatives in name of the children because the three youngest are absolutely unable to write a letter in Dutch. Ytje already regrets that she didn't write her Uncle while he was alive. Now another question: do you know if Marie Prins lives in Leeuwarden? 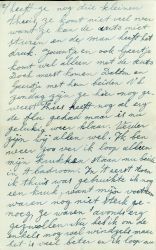 Gelsche wrote me that she married and also that the widow Prins deceased. Marta is married to a bread and pie baker or confectioner. They live in Bolsward and have a busy shop. Gelsche and Trijntje both live in Bolsward now, which is nice for Brother Dirk and Trijntje because they an visit them both. These days it is raining every day. Receive with this many hearty greetings from all of us.